Austin, Texas (CNN) - Amid heightened security, beaming supporters, and chants of ‘shame’ from dozens of black clad abortion-rights activists, Gov. 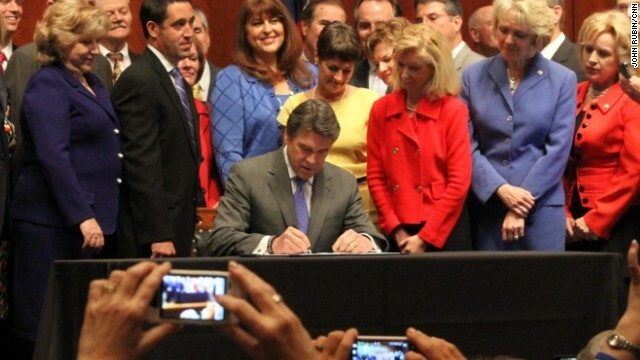 Rick Perry signed Texas’ controversial Fetal Pain bill into a law Thursday. “In signing House Bill 2, we celebrate further the cementing of the culture of life which Texas is built upon…children do deserve the respect of simple recognition before their lives are cut tragically short,” Perry said. The law, considered some of the most restrictive abortion legislation in the nation, will ban abortions past 20 weeks of gestation, mandate abortion clinics upgrade facilities to become ambulatory surgical centers, tighten usage guidelines for the drug RU486, and require doctors who perform abortions to have admitting privileges at a hospital within 30 miles of the clinic at which they're providing abortion services. For weeks, the sound of prayer and drum circles reverberated through the Statehouse rotunda as thousands of supporters and opponents of the bill descended on the capital building. The voices were loud, earnest, and often angry, and between the two sides there was little middle ground to be seen. Inside a Statehouse auditorium, the signing of the bill quickly took on religious overtones with supporters often expressing approval with an ‘Amen.’ For anti-abortion activists like Marlene Salcher, Thursday’s signing was an answer to her prayers. “I believe that life begins at the beginning because God said he knew us in the womb and he knew us from birth,” she said. Salcher was onsite at the Statehouse during some of the most intense protests over the past weeks, often holding up a small doll in the likeness of a 20 week old fetus. When asked about how she felt about the women on the other side of the issue, she paused as she tried to put herself in their shoes. Passage of the bill marks the beginning of more than a year of implementation. The twenty week ban will go into effect 91 days from the bill’s signing, while enforcement for the rest of the bill begins in September 2014. Abortion rights activists are expected to mount a challenge to the bill in court. The bill originally failed to gain approval because of a Democratic filibuster led by state Sen. Wendy Davis. Perry called the legislature into a second special session to continue consideration of the bill. The bill passed the state House and state Senate last week. "Tom. Do both of us a favor and try not to point fingers at that which you have no knowledge or basis to do so." So are you telling me that you haven't used the argument about Canada and Europe when you comment about your support for the ACA? Am I wrong about this? I'm just sayin. All I ever read about is from the liberal point of view with regards to healthcare is how we need a system more like Europe or Cananda. Am I wrong about this? Be honest. And I love the argument about how liberals are against this and rail against conservatives for being inconsistent because this calls for more govt invovlement when liberals are all about more govt involvement. Or am I wrong about that, too? I'm just trying to give you on the left a little perspective. Something you and your friends so so lack. "Texas just executed their 500th victim"
Wait wait wait. Who's the VICTIM here? So now the person who committed the crime has now switched into victim status? Wow. Just....wow. "To be consistent, I really hope you don't refer to the ACA and Europe/Canada and their healthcare systems, then"
With respect to abortion, France does not have our Constitution and does not have Roe v. Wade as precedent. The analogy is a fail. What rights France's laws protect in terms of abortion and the extent to which France can go to limit a woman's right to choose have nothing to do with the limits our laws set on such power. Our definitions of the rights that our government protects are different from theirs. There's no comparing the two things on that level. With respect to the economics and workings of "universal" healthcare systems, there are myriad informative analogies and comparisons to be made, some of which indicate things that France did may work here and others may not. Nobody ever suggested copying France's system outright and our highest court upheld the ACA's challenged constitutionality. You're straining for an "hypocrisy gotcha" again and it's just another massive fail. "the absurd reality-denial statement that "our culture has changed." I feel so sad now. So you feel that the United States hasn't evolved from where we were back in the 1960's? You honestly feel that we are no different. Gosh, I could have sworn there is no segregation anymore. I could have sworn that African Americans aren't forced to the back of the bus (that's only for republicans who don't go along with Obama now). I could have sworn that there was the Civil Rights Act of 1964 (which had a higher percentage of repubs voting in favor than dems). I could have sworn we have many African Americans in all levels of govt and representing all different types of people (see Tim Scott in South Carolina). I think it's time for you to come in to 2013. The water is warm! This is not to say that there isn't racism today. This is not to say that things are perfect. But if you can't acknowledge that our country has changed and "progressed" then I just don't know what to say. "So are you telling me that you haven't used the argument about Canada and Europe when you comment about your support for the ACA?" Yes, Tom. That is what I am saying. Now, be so kind as to point out where I have commented my support for (or against) the ACA in ... oh, say ... the past 4 years? Hint. You can't. I haven't. "So you feel that the United States hasn't evolved from where we were back in the 1960's?" You can sugar coat it and you can make it more subtle and you can have jackholes like von Spakovsky run around publishing un-scientific papers that play games with the data, etc., in order to create a smokescreen excuse for trying to enact disenfranchisement laws, but it's no different at core. We've watched 5 years of racial regression in this country triggered by the southern and conservative white freakout over the election of a black man as POTUS. The evidence of it is overwhelming. Just because the racism seemed to lay dormant for a couple decades doesn't mean it went away. And please note, there's a difference between what I'm saying and what you're saying. Yes, some laws and policies have changed. I'm talking about hearts and minds and entire subcultures of our society, which in many many ways haven't. With the reduction of health clinics, the deregulation of the gas and oil industries and failure to control air and water pollution, a fetus becoming a baby doesn't insure a good life in Goodhair's Texas. The only good thing about their complete re-write of US history to fit some stupid conservative idea from David Barton's outruight lies is that a lot of students from other states will get college entry due to the Texas kids being passed over. All it would take is one evolution-based question plus a question on Thomas Paine's role in the Revolution. You chant "health of the mother, health of the mother, health of the mother..." the whole time you're passing this bill, because you legally -can't- make it about making abortion illegal, and then when you're passing it you afirm that it was all about "recognizing the lives of children"? You're using a legal pretext to ban abortion in a ay that won't get you in trouble with the Supreme Court. So why are you publicly admitting it now and all but DARING the Supreme Court to strike it down?